THEY’RE flying little blue flags from the front of buses in Aarhus this year. They’ve also chiselled the motto, “Aarhus 2017” into the paving slabs around Denmark’s second biggest city. They’re expecting lots of visitors, though heaven knows how Aarhus’ very provincial airport will handle them. For this charming city, full of well-mannered and mellow people, is one of the European Capitals of Culture for 2017. The restaurants are undoubtedly hoping to benefit from the growing interest in new Nordic Cuisine, although some people feel the trend is something of a “King’s new clothes” tale as people salivate over locally-grown herbs and freeze-dried berries that were previously ignored. Still, there’s always traditional Danish food, which is hearty, meaty and great with a glass of beer or two. Now we are talking football here, so it is unlikely that modern – and extremely expensive – Nordic food with all its artistry and foraged beach and forest ingredients is not going to be the fare of choice for regulars at Ceres Park, the home of Aarhus Gymnastikforening or to use their correct acronym, AGF. This is a club with history. Formed in 1902, although the club’s sporting roots go back to 1880, Aarhus played in the inaugural European Cup in 1955-56, losing to eventual finalists Stade de Reims in the first round. The 1950s was a golden period for AGF, during which they won a hat-trick of Danish titles. In total, they have been Danish champions five times, the last coming in 1986. They’ve won the Danish Cup more times than any other club – nine – the last occasion in 1996 when they beat Brøndby 2-0, a game that Game of the People was present at. 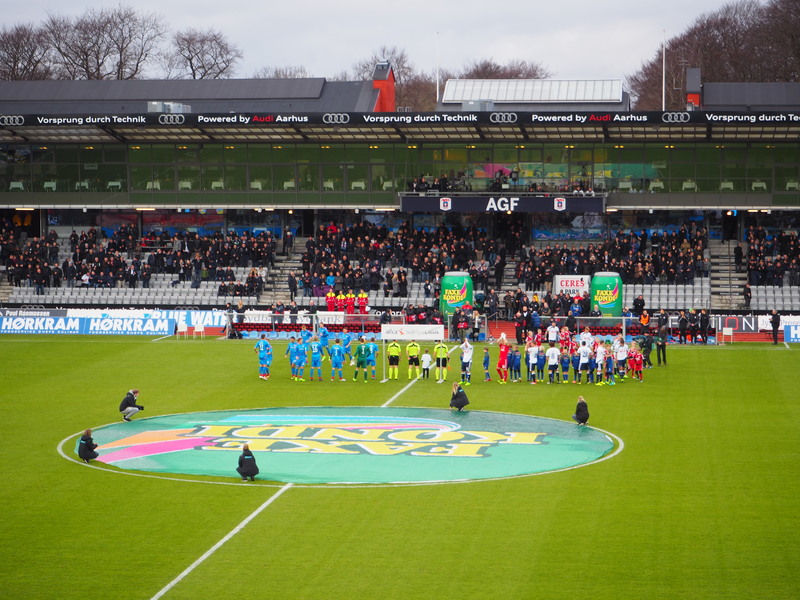 In recent years, AGF have experienced the drama of relegation, immediately bouncing back and reaching the Danish Cup Final, losing to FC København last season. In 2016-17, the winter break had just ended, with FC København (predictably) way-out in front. Danish clubs like AGF have to live with having a growing monster in their backyard. FCK are the only Danish club currently able to look Europe in the eye. That said, although the capital city club have won the title seven times in 11 years, more recently, new challengers like Midtjylland and Nordsjaelland have lifted the top prize in Danish football. But AGF remain the third best supported club in Denmark with an average home gate at Ceres Park of almost 8,000 – not bad when you consider that Danish attendances are down 22% in 2016-17. Also impressive is the fact that gates are up at AGF in a campaign that had been disappointing for the De Hviie (the whites). AGF went to their winter wardrobe in 11th place in the Superliga, six points from the bottom. The 2016-17 season is a new format for Denmark with each team playing each other twice and then the top six splitting off into a title play-off round and the bottom eight battling to stay up. There’s also the Europa play-off to look forward to. It is a system copied from Belgium, although it remains to be seen how it works out with the Danes. As it stands AGF and their opponents on February 19, AaB of Aalborg, were both destined to be in the relegation play-offs. It’s a fixture that, in keeping with the modern trend to create your own local “clasico”, has been tagged, “Den Jyske Klassiker” (The Jutland Classic) and given the two clubs are just 118 kilometres apart (1 hour 22 minutes by car, 90 minutes by train), it is a local derby full of rivalry. Not that Aalborg have enjoyed their season, either. They sacked their coach, Lars Søndergaard at the end of the year and appointed former Danish under-21 coach Morten Wieghorst in his place. It was only three years ago that AaB were Danish champions and cup winners, but since then, they’ve finished fifth both times. So, a big local derby to kick-start the second half of the Danish season. In Aarhus, a number of AaB fans had arrived early and were stocking up on beer and sausage at the many bars around town. There was no menace in the air, in fact, most Danish games I’ve been to have a very low-key atmosphere, unless you are watching FCK-Brøndby. The journey from the town centre to Ceres Park is around 30 minutes on foot, but 13 minutes on the very reliable Aarhus buses is more attractive. You can approach the ground via a tree-lined avenue, Stadion Alle, which provides a slightly bucolic backdrop for the ground. It was 3pm and the stadium was not yet open for business. The locals began queuing in a casual manner and then they started to let the people in. The ground holds around 19,000 people, so there’s plenty of room. The stadium has played host to the Danish national team, but it has also been a music venue down the years and none other than Elton John and the Eagles have appeared there. Aarhus actually has something of a rock reputation, so why one of the club’s theme songs seems to be a Danish version of “Living next door to Alice”, written by glam-rock’s Nicky Chinn and Mike Chapman (and sung by New World and Smokie as well as Randers-born artist Flemming Jørgensen) is a mystery. The pre-match experience also includes – as with a lot of Scandinavian clubs – emotional songs singing about, in this case, Aarhus – a combination of Take That meets Paul McCartney, but hey, they love their town! The stadium has a running track around it, which makes contact with the action a bit remote, but the club has added an improvised stand that sits right behind the pitch, allowing the young and enthusiastic the opportunity of connecting with their heroes. There are three sections and for the game with AaB, the fans choreographed a display of white, blue and white poncho-type jackets to create a bit of colour. Once they came alive, the fans created some atmosphere. As for the Aalborg “drenge”, they were perched in the top corner of the opposite end, needing binoculars to really appreciate what was going on around them. There wasn’t much to see in the first half. The opening opportunity fell to the visitors’ Jakob Blaberg, whose header from a free kick struck the woodwork. AaB almost scored an own goal when a defender mis-timed a clearance and goalkeeper Nicolai Larsen had to palm the ball away from danger. AGF applied some pressure in the closing stages of the half, with Martin Spelmann volleying just over the bar and Morten Rasmussen attempting a clever backheel. After surviving a couple of scares and goalmouth scrambles, AaB started to get on top in the second half and Jakub Sylvester had two chances but proved to be too ponderous. In the 57th minute, Sylvestr made amends when he put AaB ahead, slotting home after good work by Joakim Maehle. AGF should have equalised through Australian Chris Ikonomides who saw his goal-bound effort saved on the line by Markus Holgersson, but in the 78th minute, Dino Mikanovic and Danny Olsen combined to create a simple chance for the AGF substitute to score. And that looked to be it until two minutes into added time when AaB snatched victory, Jannik Pohl, who had replaced goalscorer Silvestr, volleyed into the net at the far post following a corner. Final score AGF 1 AaB 2. And then into the night. It may have only been 6pm, but Danish streets seem much darker than those in Britain. It could be something to do with the country’s renowned eco-conscience or just that street lamps hang above the centre of the road – stylish they may be, but they make for a dimly-lit walkway. Perhaps in Britain we crave everything to be over-illuminated, or is it just Nordic noir at its very best? Victory for AaB meant they had completed a 2-1 double over their local rivals. It may not have been a “klassiker” but it was rarely dull. AGF and AaB will surely meet again this season, and then the stakes could be much higher.